The country of 200 million people had hoped to win the title at home and erase memories of its 1950 World Cup defeat to Uruguay in Rio de Janeiro, the notorious "Maracanazo" at the Maracana Stadium. But instead Brazil suffered the worst defeat in its 100-year footballing history, falling 7-1 to Germany at the Mineirao Stadium in the southeastern city of Belo Horizonte -- now the infamous "Mineirazo." "It looked like a game between adults and children," wrote the prominent sports analyst Juca Kfouri on his blog. "Brazilian football has never experienced such humiliation." The country's newspapers called it the biggest disgrace in the team's history, with globoesporte.com dubbing it the "Shame of Shames." 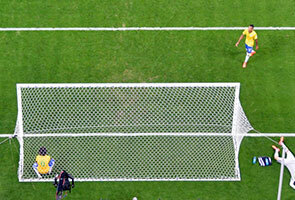 But other analysts said the Mineirazo could not compare to the Maracanazo. "In 1950 we felt we had an unbeatable team and losing at the Maracana was unthinkable," Michel Castellar, an analyst at the sports daily Lance, told AFP. "This time, we knew that we had a team with a lot of flaws and that maybe they would not reach the final. Was it a national humiliation? Yes, because of the number of goals. But it wasn't a new Maracanazo," he said. In 1950, Brazil had yet to win the World Cup and getting the title would have put the developing country on the map. Since then, the Selecao has won a record five World Cup titles, gave the world the "jogo bonito" (beautiful game) and produced football giants as Pele, Garrincha, Zico and Ronaldo, winning over fans among the rich and the poor, white or black. Today's superstar Neymar was unable to play the semi-final after suffering a broken vertebrae in the previous game. The power of football put a lid on protests that had marked the run-up to the tournament. Hundreds of thousands of people had held protests last year during the Confederations Cup, denouncing the record $11 billion spent on the World Cup and demanding the money be spent on better hospitals and schools instead. There were a few protests that attracted small crowds during the World Cup, though after Tuesday's defeat some fans wondered whether hosting the tournament had been worth the cost. Although the Selecao lost, the tournament itself can be considered a success, with fears of chaos never materializing despite delays in the construction of stadiums, experts said. And the games were full of surprises, upsets and goals. "This World Cup has been a real gift for Brazil," said Pedro Trengrouse, a United Nations consultant for the tournament. While the low point for fans was seeing the Selecao's horrific defeat, experts say Brazilians now know how to cope with both triumphs and disappointments. "There have been many cups since 1950. There were victories and defeats. Everybody is used to this," said Lamartine da Costa, a sports management expert at Rio de Janeiro State University. "The Maracanazo was something that was never repeated. It was unprecedented," he said. Costa said the continent-sized country was much more isolated in 1950. "This isolation created an inward-looking culture. Brazilians don't understand others very well. The same thing happens with other large countries like the United States, Russia or China. "There is an unrealistic feeling of power and surprises come when things you expect don't happen. One of the theories is that's what happened in 1950," he said. Today, Brazil is the world's seventh biggest economy and 40 million of its people were lifted out of poverty in the past decade. They demand more prosperity and better quality of life, but football is no longer their only passion. And Brazilians relate less with their millionaire stars, who play mostly across the world in Europe. "Before, the players represented a football closer to amateurism," Costa said. "Their behavior was exemplary, representing the values of the homeland and the love of football."